So the streak of volunteering continues. 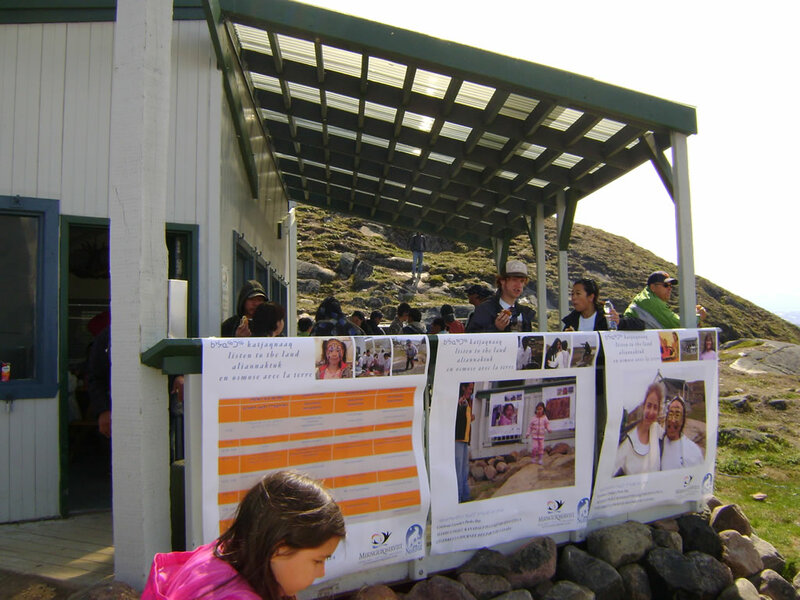 We spent this past Saturday helping out at the Canada Parks Day celebration at Sylvia Grinnell Park. The gods were happy that day my friends. They graced us with beautiful weather for the entire 5 hour outdoor event. Clear skies, bright sun and lots of wind (which translated to a reprieve from the mosquito assault… for a little while at least). I took to the grilling duties promptly at 11am just as the first wanderers started appearing. Burgers and hotdogs were on the menu and with the weather behaving itself we were expecting a crowd. While Suzanne manned the table, taking and dishing out orders, I cooked like there was no tomorrow. I’m no stranger to the grill but I never had to contend with a line up before. It can be quite an overwhelming experience even with pair barbeques and cooks. I admit, a couple burgers may have been still been mooing when they left the fire, but for the most part people were satisfied and came back for seconds, thirds and even fourths. Once we caught on that “cooked till it’s crispy” and “with cheese” were the popular cooking preferences of most, we were belting them out like a conveyor belt. I got into such a rhythm that I didn’t even realize 2 and a half hours passed. I had a feeling I’d been there for a while when I finally stepped away and noticed my forearm fur was singed and my glasses were coated with a nice layer of beef juice. Finally when there was a lull in customers we got relieved and had a chance to enjoy some of the festival from the other side of the barbecue. The park changed a lot since we were last there. It was much greener and the river was no longer ice choked. The angry rapids and twin waterfalls could be seen all the way from the pavilion making it an undeniably enticing destination. We made our way down the hill to the river bed and traversed the rocky shoreline. It’s a wicked workout but my goodness, don’t be dumb like us and do it in running shoes. Nevertheless we weren’t going to let a little thing like a potential catastrophic wipeout prevent us from exploring. When we finally reached the sandy beach – yes we have sandy beaches just like the south up here – it kind of put things back into perspective about how new we actually are to this area. I personally have been lost in a whirlwind of volunteering the past couple of months. So much so that I started to lose sight of the fact that there is still so much to see, hear, taste, feel and experience up here. Standing on an outcropping of rocks taking pictures of almost intoxicatingly furious waterfall was a real treat that’s been burnt into my memories. It turned out to be yet another great day with a lot of familiar faces. There was children’s face painting, a scavenger hunt, a bannock competition, traditional tea tasting and food galore. Best of all though there was just good old-fashioned hanging out. Nothing beats just drinking in a magnificent day with your buddies. We’ve uploaded a ton of pictures to the Photo Diary. I’ve been terribly lax in updating but with good reason. We’ve just been so busy running around that I just didn’t have any time to do it. Regardless there’s over 250 new pics there now dating all the way back to the infamous night of Fondue Debauchery. Some you’ll recognize from some of our posts but many haven’t been revealed until now. I really haven’t been in the mood to blog much lately. I’ve just been wanting to take in all my surroundings and process things. I’ve also been enjoying the fact that I (almost) have an appetite again, and I’ve been able to get full nights of sleep – for the most part. The most tumultuous upheaval I’ve ever experienced is not quite over yet, but the biggest headaches are out of the way for now. And now, I can breathe. I’m just glad that Ian’s been able to keep many of you updated with our initial reactions and experiences in Iqaluit. It’s been a serious learning curve that we aren’t over yet, though our levels of comfort are steadily on the rise. It’s hard not to feel comfortable here. The people we’ve encountered thus far have been very helpful and friendly – aside from a post office experience. I haven’t really had a chance to be doing what I will ultimately be doing for my job, but my division had its annual meetings this week, so it was a fantastic introduction to the people I’ll be working with, and what they’ve been doing over the past year. I can already see the partnerships that I’ll be involved in for the coming years. I have to say, I’m still very nervous about the job itself. I feel that expectations are high for me and I certainly hope not to disappoint. 1. I wish I had known just how many ways an offer of housing could fall through up here. Our housing situation has been a roller coaster from the beginning. There are days where we have housing in theory. And there are days we are homeless. We are still holding on to a few shreds of hope for a more permanent solution to housing, however are working into several layers deep of contingency plans. If I’d known that we would have had this many issues, I most definitely would have placed my name on housing waiting lists when I first accepted the job offer. In fact, I actually would have considered putting myself on a waiting list back when I applied for the job…just in case. 2. I wish I had known just how hilly Iqaluit is. I probably would have started working on my cardio sooner. 4. I wish I had known that we would not be in a unit with a full kitchen. We likely would have just packed away all of our kitchen goods and sent them with the movers. It’s hard to use a saucepan or pot in a microwave or on a toaster. 5. I wish I had known how cool YakTrax were for walking on ice. I think I would have picked up a pair of these for my boots long ago. It’s amazing the amount of confidence you can gain in walking on icy surfaces when you have these on. However, it should be noted that extremely smooth and wet ice can still be very slippery, even with grippers on your boots. Ian and I found that out tonight as we giggled and slipped our way about town – trying to safely navigate the icy and hilly walking paths without falling flat on our faces. No wipeouts yet though! 6. I wish I had known that while vegetarian food does exist in Iqaluit, foods that can be traditionally served meatless typically are not. I found an egg salad sandwich the other day that I’m pretty sure was filled with chunks of bacon – though I cannot confirm that they were not soy bacon – and cheese ravioli that I was served tonight was served in a meat sauce. I have to learn to ask more questions about the food prior to ordering it I suppose. Not to worry…I’ve become pretty adept at picking around food items that I do not wish to eat. And since Ian will eat pretty much anything, we’re a good pair.